Do you like to chill in the hot places? Have you ever dreamed of being in paradise? Maybe I can make that dream become a reality! If you want to find out more, keep reading! Wow, have you ever seen anything like it? This is a true masterpiece – the way the creator has made the building at the back using building blocks (Builders’ Club Only) is just unbelievable. The design of the whole beach resort has been designed well. The transition from the sand to the water is perfection. The clouds and the sun add to the realistic effect of a sunny beach. There are plenty of things here to explore around this beach – some of which we are going to take a look at. Here is where you can get ice cream or your refreshments! In this heat you’re definitely going to need an ice cold drink. The row of the ice cream makers look like a perfect rainbow of colours – the different shades of colours work really well. If you want to work in the bar – which I think is amazing – just type “!mainbar”. There’s also another bar that has slush machines where you can also serve Habbos; to work in this bar type “!sidebar”. To get out of the work areas just type “exit”. Have you ever wondered how fun it would be to ride a plane on the beach? Now you can! Just go to the dock where there are two plane landing pads – blue and red in colour. To ride these planes you can simply click on one of these pads so you’re sitting on it. 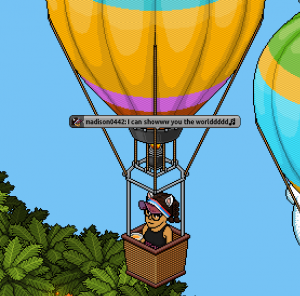 After that you just hop off and you’re flying! You can’t go over the water though – which is a bit of a shame – so try and keep away from the water. Want somewhere on the water to party? With this yacht, you can do it in style! 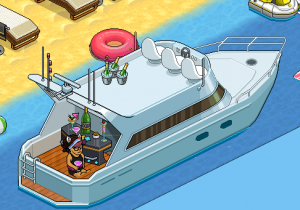 You can sit on the seats at the front of the party yacht or chill at the back where the party bar is. I must say that this is an amazing feature to the beach resort! Anyone want to come and take a ride with me? This is an amazing VIP area – one of the best that I’ve seen – and from what I know so far it’s free access for now! There’s a selection of food stands including a sweet stand and an ice cream stand. For your VIP refreshments a beverage tower and a bling fridge can be used. Deck chairs are placed next to palm trees down the front of the central VIP area. You should take a look for yourself! You don’t see these at a beach resort every day! View the astonishing scenery as you pass by the white fluffy clouds. If you are afraid of heights then you might want to stay away – unless you (or your friend) want to conquer that fear. Without the beach this wouldn’t even be a beach resort! The golden sand on the floor has a nice texture to it. There’s some furni that you can use to chill in the water – maybe you could take a dip or splash your friends here! If you want to relax, just take a seat on the beautiful pool-side lounges; ice cream makers are conveniently right next to these lovely furnishings so you don’t have to get up. What are you waiting for? Go and have some fun! Would you come here to enjoy the sun? What do you think of this room? Let us know in the comments section below! Click here to go to the room now!